Pastiche is a game allowing you to reproduce some of the great pieces of art from throughout history. There are two paintings each from 17 masters. Thankfully (for me! ), no artistic ability is required as the paintings are the theme to a set/hand management Euro game where players compete to complete enough victory points worth of paintings. 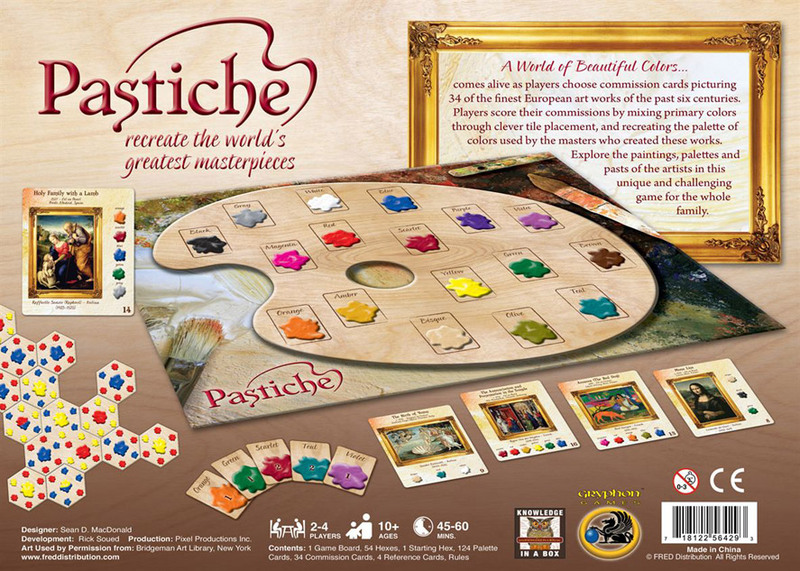 Pastiche takes players through the steps of acquiring the colors needed to complete different paintings throughout history. Each turn starts with a player placing a hexagonal tile that shows a primary color in the center (or sometimes two), and six primary color ‘blots’, one on each corner of the tile. These tiles are placed adjacent to a growing mass of such tiles. Once placed, a player will gain a color card based on the colors that appear next to each other at a vertex, one card for each 2 (secondary) color, or 3 (tertiary) color combination. Alternatively, the player can choose to take a single primary color show at the center of the tile they played. Next, cards can be traded with opponents, or with the bank. Trading with the bank requires 3 cards of the same color to make any secondary, tertiary, black, or white card. White and black can make gray, and brown and yellow make bisque. Primary colors can only be obtained through tile placement, or by trading a different primary color plus one of anything. Players can trade one of their two paintings with one from the center (there are 4 available). Paintings in your hand can’t be completed by other players, while the 4 center gallery paintings can be completed by anyone. The color cards in hand may now be used to complete a painting. Each paining will show the colors needed for completion, as well as the points it is worth. If a painting is completed, a new one is drawn to replace it, and play passes to the next player following a quick check to ensure the player has 8 or fewer cards. Play will continue until one player has enough points to end the game (the number needed depends on players). The winner will be the player with the most points in paintings, with points assigned for having color cards in your hand that your unfinished works would have used. There is also a bonus for having two paintings by the same artist. The rules and play for Pastiche are not complex and can be picked up by non-gamers, though I don’t think I would recommend Pastiche for first time gamers (unless they have a specific interest in the theme). Pastiche doesn’t strike me as ideal for a gateway game if you goal is to attract people to gaming in general. I feel the game sits at a place where some experience with non-classic games would benefit a player. You spend much of the game studying your palette hexes, determining how best to place them for what you need. While this can be understood by anyone, I haven’t seen the mechanic be extremely engaging to non-gamers. It can almost feel like work figuring out what colors you can make, and they will work with your hand to trade up to more needed colors. On the plus side, this does give the game something for gamers to sink their teeth into; but it feel s like it isn’t quite enough to keep a groups interest for many plays. In the end, I think Pastiche is an interesting enough game to make it worth playing, but lacking the depth to keep bringing people back over and over again. Scores tend to be close since each paining it worth the exact value of the sum of the cards that go into making it. This means that often times; winning will be determined by the player who is best at manipulating the color palette tiles. While this will be welcomed by strategic gamers, it can also lead to issues with players who spend a lot of time analyzing a position. Pastiche works well at the 45 minute level, but can be stretched to well over an hour if one or more players are grinding out their turns, and there’s not quite enough game here to allow the other players to make good use of this excess time. If you like art, or want to introduce friends with artistic tastes to gaming, Pastiche will do a great job of drawing people in. I think art teachers may find this game an interesting teaching aid, potentially getting students to “study” certain paintings while playing a game. The painting tiles are large and pretty, the color palette hexes form an attractive layout as the game progresses. If you’re looking for a 45 minute Euro with art theme, Pastiche may be for you. If this doesn’t sound like you, the game may hold your interest for a few plays, but probably won’t become a weekly favorite. Add a Review for "Pastiche"